If you’re fearless, brave, and adventurous, this game is for you! If you finish what you started, this game is for you! If rabid monkeys, stalking lions, charging rhinos, snapping crocodiles, a ruthless hunter, unpredictable fast-growing carnivorous plants, and flash floods that make the ground shake are the adventures you’re looking for, then this game is for you! Welcome to the world of Jumanji™! Do you have what it takes? Do you have the guts and the bravery to keep going as the Jumanji™ slot will make you fear the monsoon, makes you want to run when a wild stampede runs into the game, makes you lose your mind when it’s time for the monkey madness, and makes your heart beats faster when the wild-growing carnivorous plant shows up from nowhere! Brave and fearless you must be! If so, then choose your pawn and set out on a deadly journey in which you’ll decode rhyming card messages that could spell disaster! But you must be warned! Once you roll the dice and you fail to escape, the jungle could swallow you whole and the only way out is to finish the game. Only then will the terrors of the jungle disappear. 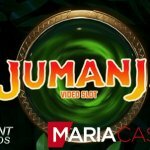 It was in 1995 that the first Jumanji™ film was brought to the cinemas and while people would initially believe it’s a typical family film, produced to entertain children and their parents, they soon found out that the adventurous film touched young and old and even the toughest out there started to appreciate the film. The film takes off in 1869 where you’ll be presented a drumming chest, buried in the woods. Comments like “What if someone digs this up?” and “God help them!” make you assume that this should have been the end of the story, but unfortunately for Sarah and Alan, this is just the beginning. It was Alan who as a young boy discovered the mysterious Jumanji board game, not aware of the unimaginable powers of the mysterious looking board game. In a NetEnt Casino, you must wait…until the dice read five or eight! …after Judy and Peter move into Alan’s childhood home. Exploring their new place, they end up in the attic where they are spooked by a bat. Soon after, Judy and Peter find the most unpredictable board game in the attic and begin playing it. At first, the Jumanji game releases a swarm of big mosquitoes followed by a troop of rabid monkeys. Scared of what is happening, they know that was is happening will all disappear when the game ends and they continue playing. Do not begin unless you intend to finish! Are you ready for the biggest video slot adventure ever? Peter’s next roll releases a lion while Alan soon makes his appearance, released from the jungle after 26 years, now a 40-year-old man in a jungle garb. Alan managed to trap the lion in a bedroom and shows his gratitude to Judy and Peter. Alan soon finds out things have changed and it’s not his parents living in his house, but Judy and Peter. They start to realise they need Sarah to finish the game after which they try to locate her. Even though she’s still suffering from a posttraumatic stress disorder after Alan’s disappearance, fainting when Alan shows up and freaking out when seeing the Jumanji board game, she eventually accepts the fact it’s her turn to roll the dice. Sarah’s first roll releases fast-growing carnivorous plants and it’s Alan’s turn that brings up a good old friend from the jungle, the big-game hunter Van Pelt. What will follow is a stampede of various animals, a pelican stealing the game and the arrest of Alan. Later, Van Pelt is the next to steal the game, but Peter, Sarah, and Judy follow Van Pelt in order to retrieve the game after which they reunite with Alan. Meanwhile, the mansion got completely overrun by jungle wildlife. They release numerous calamities including the return of Van Pelt. That’s when Alan drops the dice, winning the game, causing everything that had happened during the Jumanji board game to be reversed. Jumanji™, a game for those who seek to find a way to leave their world behind! 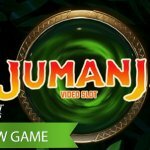 It has been a while that Jumanji premiered, in 1995, but it was in June 2018 that the film was involved in another premiere after NetEnt brought the adventurous board game to the reels in the Jumanji™ slot. 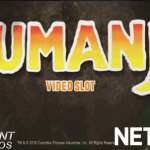 With this branded video slot, NetEnt brings its own twist to the Jumanji™ universe by transforming the calamities that befell Alan, Sarah, Judy, and Peter into features with slot mechanics. The Board Game feature is unique and among the first of its kind as it combines elements of board games and Free Spins features. Fun fact 1: The word “Jumanji” means “many effects” in Zulu. Thanks to NetEnt’s brilliant team of developers, you’ll be drawn into a video slot which manages to bring as much excitement as the 90’s film still does every time you see it. As soon as you’ll open the branded video slot, it’ll lead you to the craziest adventures with your adrenaline levels on the rise! The familiar sound of the drums will make you believe you entered the world of Jumanji straight away, but that’s just the beginning as the 5 distinctive reels, showing a geometric form where the reels are 3, 4, 5, 4, 3 symbols high from left to right, are surrounded by the most dangerous board game invented. This same board game will remain inactive during the main game, though, but once activated, you better prepare yourself for the many calamities that might follow. Fun fact 2: Jumanji was actually based on a children’s book published in 1981 by Chris Van Allsburg. Based on a children’s book, you might believe nothing too bad can happen but wait until the Monkey Mayhem is about to mess up the reels, the ground starts shaking because of the Monsoon Wilds, a Wild Stampede might scare the hell out of you while or when Sticky Vines are totally out of control. So if you have the bravery it needs to open the Jumanji™ slot, you’ll be assured to have an adventurous time on the reels. 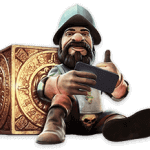 Besides the four calamities used for the Random features during the main game, you can also look forward to these same four calamities as Free Spins features during the most exciting board game you’ll ever get a chance to play. It’s incredible how NetEnt brought its own twist to the Jumanji universe by transforming the calamities that befell Alan into slot features, but nothing too special should be expected from the betting options. 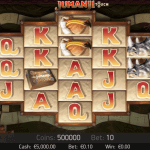 The Jumanji™ slot can be played with a minimum bet of 0.10 while a maximum bet of 200.00 is available for those who do not fear a high bet. It will be those players who will definitely qualify for the Jumanji™ slot, not being afraid to take a risk here and there. Between the 0.10 bet and the 200.00, many possibilities are available thanks to the 10 bet levels and the 8 different coin values. 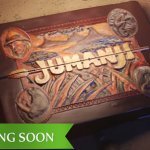 The Jumanji board game: Do not begin unless you intend to finish! Just realise that you have a choice, but once you roll those dice, there’s no way back! It’s a choice you’re having, but a decision must be taken quickly as soon as three Scatters appear on the reels activating the Board Game feature. You’re about to enter the wild world of Jumanji and must be prepared for an unpredictable game! You’re about to choose your pawn and set out on a deadly journey in which you’ll decode rhyming card messages in order to predict the disaster you’re about to face. Your pawn will be moved across the board depending on the outcome of the dice and either a coin win will appear in the heart of the game or a rhyming message. Decode the message and you might find out what’s coming your way. While the use of the Jumanji board game is what makes the Jumanji™ slot as unique as can be, the game’s true action will come from the four calamities turned into slot features. In both the main game and during the Board Game feature, you’ll be awarded the same slot features including the Wild Stampede, Sticky Vines, Monsoon Wilds, and the Monkey Mayhem feature. If the Wild Stampede feature is what’s coming, rest can’t be assured! You’ll be facing rhinos stampede across the game leaving a whole bunch of Wild symbols behind on the reels. It’s just one of the four calamities used in the Jumanji™ slot and scary as a stampede sounds, I’m not sure if this is the slot feature that should fear you most. Hold on tight if you don’t want to be on the carnivorous plant’s menu which is perfectly been hidden in the main game and in the Board Game feature. The Sticky Vines feature ends up with the wild-growing carnivorous plant putting its arms everywhere possible. Some symbols will be captured by the plant in order to keep them there while the rest of the symbols keep spinning. Rest will return as soon as no new symbols of the same sort will be captured by the Sticky Vines feature after which the game returns to normal. See you later alligator definitely doesn’t apply to the Monsoon Wilds feature which will make the ground shake while one or more alligators will make an appearance leaving two reels covered with Wild symbols. That will definitely add to your chances of a big win but the best is yet to come. Because if you think that the Rhinos, Alligators and a wild-growing carnivorous plant is what should worry you most while playing the Jumanji™ slot, you haven’t met the mischievous bunch, the wildest of them all! They are not the largest animals and certainly not the strongest, but don’t underestimate the rabid monkeys when getting involved in the Monkey Mayhem feature in which this bunch will mess up the entire game!